The banknotes introduced in Zambia in August 2018 have just been published on this website. Follow this link for more details about these notes. 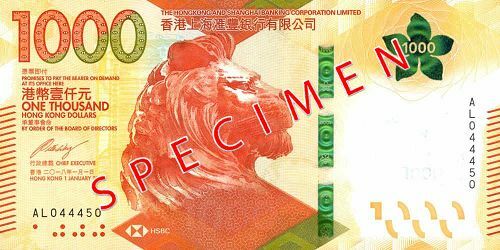 The banknotes introduced in Hong Kong end of 2018 (Bank of China, Standard Chartered Bank and Hongkong and Shanghai Banking Corporation) have just been published on this website. 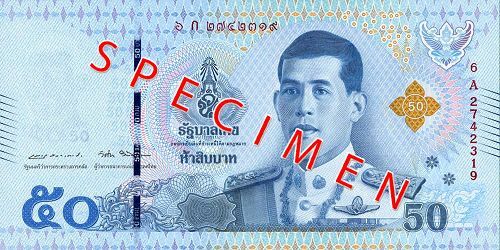 The banknotes introduced in Thailand in 2018 have just been published on this website. Follow this link for more details about these notes. The banknotes introduced in Vietnam since 2003 have just been published on this website. Follow this link for more details about these notes. The banknotes introduced in Armenia on 25. December 2018 (1.000, 2.000 and 5.000 Drams) have just been published on this website. Follow this link for more details about them. 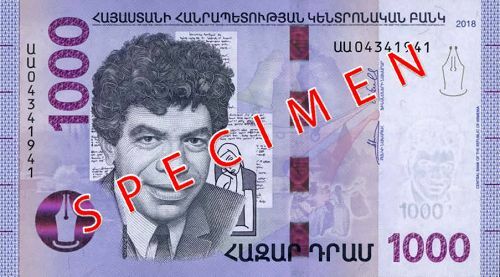 The banknotes introduced in Armenia in November 2018 (10.000, 20.000 and 50.000 Drams) have just been published on this website. Follow this link for more details about them. The National Bank of Bulgaria has anounced, that it will introduce a improved 100 Leva bill on 28. December 2018. The three banknote issuing banks in Hong Kong (Banco da China, Standard Chartered Bank and Hong Kong an Shanghai Banking Coproration) have introduced their new 1.000 HKD today. The Governor of the Central Bank of Egypt, Tarek Amer, has announced some days ago, that the new 10 Pound notes planned for introduction in 2020 will be printed on polymer substrate. The Central Bank of Yemen has announced, that a new 100 Riyal banknote printed in Russia will be introduced in 2019. Very likely the 50 Riyal note will be replaced by a coin. The Bank of Mauritius has introduced a new 2.000 Rupees banknote similar to the currently circulating one but printed on polymer substrate. The commemorative issues introduced by the Bank of Transnistria since approx. 2014 have just been published on this website. Follow this link for more details. The United Arab Emirates Central Bank has announced, that it will issue a new commemorative note (100 Dirhams) to celebrate the Year of Zayed. On 1. 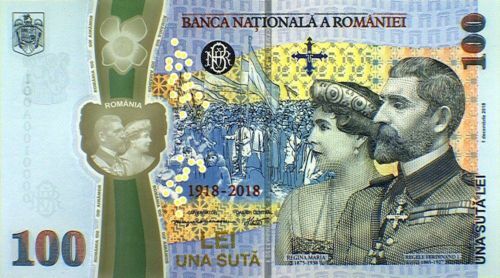 December 2018 the Romanian National Bank has introduced a new commemorative banknote (100 Lei) celebrating the 100th Anniversary of the unification of Transylvania, Bessarabia and Bukovina with the Romanian Kingdom in 1918. The Bank of the China People's Republic will introduce a new commemorative note (50 Yüan) on 28. December 2018. The note commemorates the 70th Anniversary of the Chinese Yüan. The National Bank of Abkhazia has introduced its first commemorative note a few weeks ago. Follow this link for more details. The new Canadian 10 Dollars banknote featuring the Nova Scotian businesswoman Viola Desmond has been introduced today. Source: www.mriguide.com and Bank of Canada. According to the Central Bank of Armenia a new family of banknotes will be introduced on 22. November 2018. The governor of the Central Bank of Algeria announced, that new banknotes of 500 and 1.000 Dinars with enhanced security features will be introduced in the near future. The last series of circulating banknotes in the Federal Republic of Yugoslavia (1992 - 2006) has been published on this website. Follow this link to view the notes. The Yugoslav Dinar (YUM) was dropped in 2003 on the territory of Montenegro, where the Euro is used now. On the territory of Serbia the Yugoslav Dinar (YUM) has been replaced by the Serbian Dinar (RSD). The currently circulating banknotes of Ukraine have been published on this website. Follow this link to view the notes. The governor of the Central Bank of Guinea announced, that new banknotes of 10.000 and 20.000 Francs with reduced dimensions will be introduced in the near future. 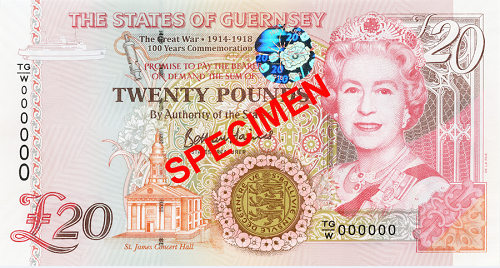 The States of Guernsey have introduced a new 20 Pounds banknote to commemorate the Centenary of the end of World War I. The Bank of Zambia will introduce upgraded banknotes of 10 to 100 Kwacha on 10. November. The Bank of Ireland as well as the Danske Bank confirmed plans to introduce polymer banknotes early next year. The National Bank of Tajikistan intends to introduce new banknotes with enhanced security features. The Governor of the Bank of England, Mark Carney, confirmed that a scientist will be pictured on the forthcoming 50 Pounds note printed on polymer substrate. A new series of banknotes printed on hybrid substrate is expected to be released in November 2018. The exact date is yet to be anounced. These new notes will circulate in parallel with the current ones.